Our Wedding Coordination and Planning makes your special day worry and stress free. Experience our full service Wedding Coordinator and Planner when combined with our DJ Services. Planning a wedding is stressful — let us help you relieve some stress! Our wedding experience, combined with your vision for your wedding, will help ensure things run as smoothly as possible and that you can fully enjoy your big day without having to stress about the details! Ceremony & reception walk through at the venue with couple 3-4 weeks prior to the wedding. Discuss the final details and develop the wedding-day timeline. Attend and supervise a 1-hour rehearsal for the wedding day. Obtain copies of all vendor contracts. Review and confirm details and timing of events with all vendors. Confirm all vendor on-site call times for day-of one week prior to wedding. Ensure that bride and groom, wedding party, family and friends are aware of roles and duties. Organize and cue bridal party’s processional and reception entrances. Pay balances and gratuities to all vendors. Upon coordinator’s discretion, if an assistant is deemed necessary, one will be provided. Unlimited contact via email or phone to consult with you at any time during the contracted period leading up to your wedding. Up to 10 hours of day-of coordination. Collect all gifts and deliver to pre-discussed arrangement. Collect left-over decor and centerpieces and any other wedding day items and deliver to pre-discussed arrangement. For more information about our Wedding Coordinator + DJ Service in Santa Barbara contact us. 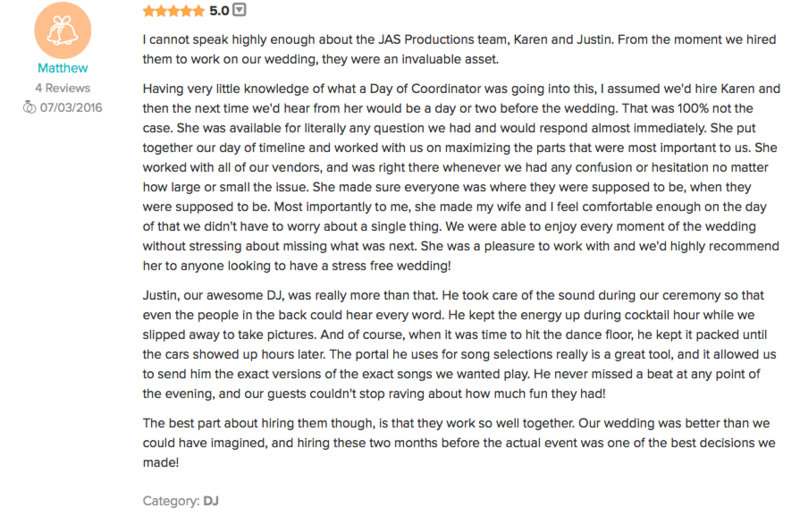 If emailing directly about Wedding Coordination, you can email Karen at Coordination@djjasonline.com. 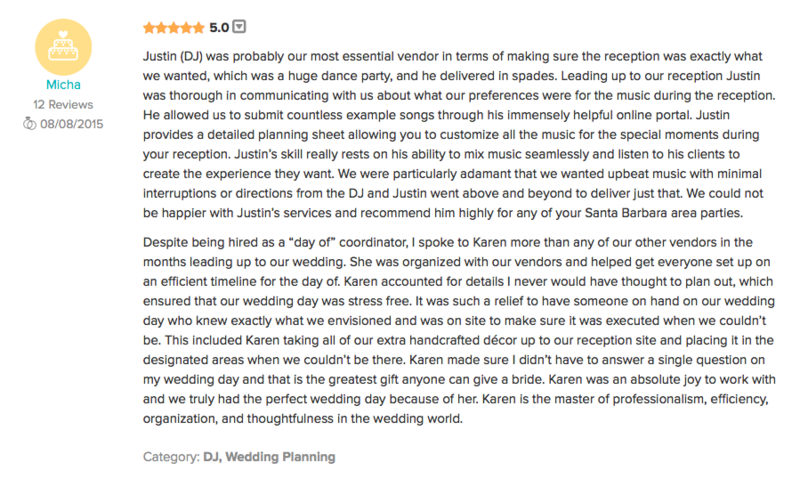 We used JAS as both our DJ and Day of Coordinator and our reviews for both services are below – to sum it up though, Karen and Justin are amazing professionals in the wedding industry and really made our wedding day as perfect as could be! Justin (DJ) was probably our most essential vendor in terms of making sure the reception was exactly what we wanted, which was a huge dance party, and he delivered in spades. Leading up to our reception Justin was thorough in communicating with us about what our preferences were for the music during the reception. He allowed us to submit countless example songs through his immensely helpful online portal. Justin provides a detailed planning sheet allowing you to customize all the music for the special moments during your reception – from the introduction to your final song on the dance floor and everything in between. Most importantly, though, he took our suggestions and created a soundtrack that could not have beaten. We had what we later found out was a longer than average reception (appx. 6 hours) and we did not do the usual bouquet/garter toss or games in between, which meant that Justin was heavily leaned on to entertain our guests. His musical selections built through the night to end in a high energy dance party despite the long day. Justin’s skill really rests on his ability to mix music seamlessly and listen to his clients to create the experience they want. We were particularly adamant that we wanted upbeat music with minimal interruptions or directions from the DJ and Justin went above and beyond to deliver just that. He also did all of this at a venue that is known for having strict sound regulations, which he took great care to adhere to, while still making sure our dance floor stayed full. 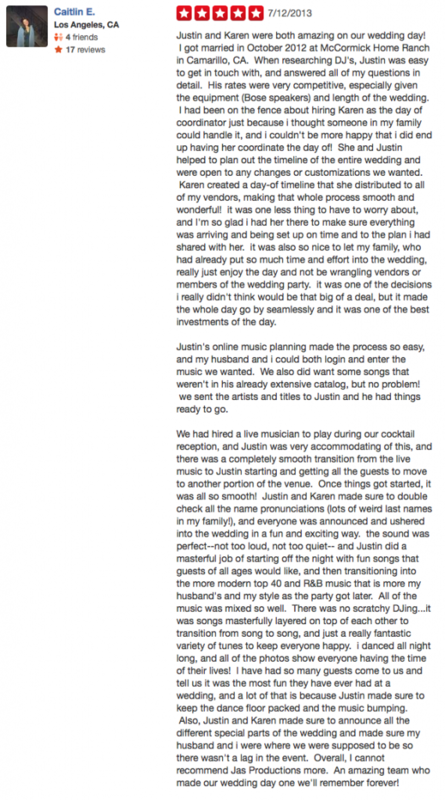 We could not be happier with Justin’s services and recommend him highly for any of your Santa Barbara area parties. 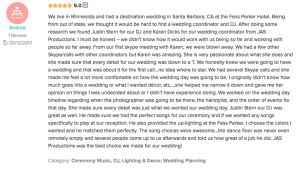 Karen (DOC) – When we began planning our wedding we didn’t think we would need any help, but planning a Santa Barbara wedding from New York quickly proved to need an insider’s knowledge. Karen was the perfect liaison. Despite being hired as a “day of” coordinator, I spoke to Karen more than any of our other vendors in the months leading up to our wedding. She was organized with our vendors and helped get everyone set up on an efficient timeline for the day of. Karen accounted for details I never would have thought to plan out (i.e. who was getting me to our ceremony – to which my answer was whoever is around, until I realized I actually needed a better plan), which ensured that our wedding day was stress free. It was such a relief to have someone on hand on our wedding day who knew exactly what we envisioned and was on site to make sure it was executed when we couldn’t be. This included Karen taking all of our extra handcrafted décor up to our reception site and placing it in the designated areas when we couldn’t be there (i.e. signs, centerpieces, lawn games etc.). Karen made sure I didn’t have to answer a single question on my wedding day and that is the greatest gift anyone can give a bride. Aside from managing our day, she also made sure we were taken care of – including making sure there were extra cupcakes for us at the end of the night (not an easy feat!). Karen was an absolute joy to work with and we truly had the perfect wedding day because of her. 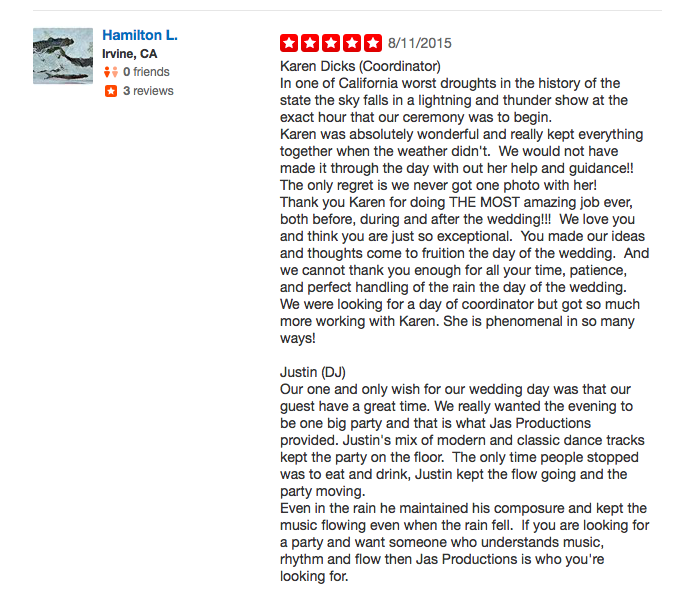 Karen is the master of professionalism, efficiency, organization, and thoughtfulness in the wedding world. We could not recommend Karen more highly as a coordinator.